Ireland’s great motorway network now means that you can travel the 250km from Dublin to West Limerick in less than three hours (taking local roads to bypass traffic blackspot Adare, of course). It’s brilliant, you simply hop in your car, maybe make one five minute fuel stop and you’re there before you know it, with dual carriageway or motorway most of the way there. When I first started driving this route in the early 2000s it used to take around five hours. And that is about how long it currently takes in the Renault Zoe pure electric car. 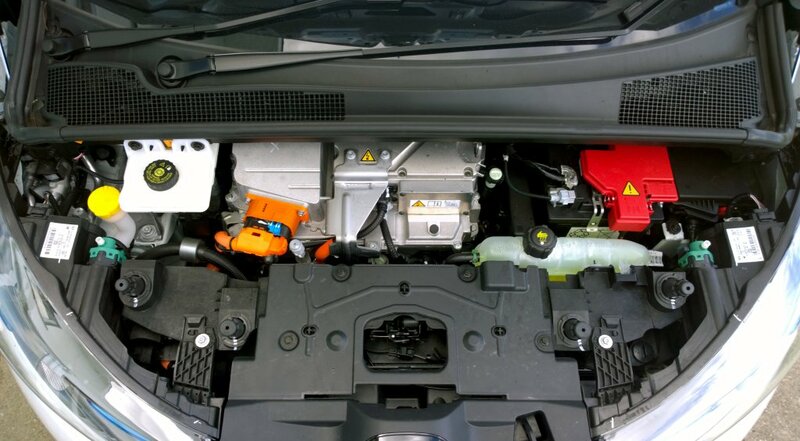 Unlike a hybrid, there’s no petrol/diesel back up engine in an EV – the Zoe runs totally on electricity. This five-door hatchback is essentially a city car and it is brilliant in the city. The electric ‘engine’ and automatic transmission mean it’s very peppy at the lights, there are no emissions and it’s very quiet. There is an artificial noise – a mournful moaning whoosh – that sounds when you’re driving at low speed to alert pedestrians to your presence. I found the Zoe has a range of around 130kph, so range anxiety – fearing the battery will die before you reach your destination – is unlikely to be an issue for urban commuters and if you do get a little bit panicky, there are loads of charge points in Dublin. But who spends all of their time in the city? Every car deserves the occasional road trip. So I took our Renault Zoe out of its urban comfort zone, down through the country, arriving at my destination 250km away six hours later (yes, you read that right). Admittedly, I was very conservative with my range on my way down and drove the Zoe like a normal car so I had to stop to charge four times – three essential, one a range anxiety issue. In my defence, I did have charging issues before I left the city – two of the chargers I visited were Fast Charge DC only (the Zoe takes an accelerated charge from an AC charger) and non-EVs were totally blocking the on-street charger outside the Ulster Bank in Walkinstown. I took a punt on our next option and decided I wouldn’t have accessibility issues at the Luas Park and Ride at the Red Cow – I didn’t, but five minutes after I plugged in, there was a powercut. One quick call to ESB eCars helpline later and I was on to the next charge point. Eventually, an hour after I left home, I was able to charge my car. I was disappointed with the very basic ESB eCars Connect Android app – while it maps all of the charge points in the country and tells you if they’re working, it doesn’t tell you if they’re currently being used and doesn’t offer a routing system to make the most of your journey. A spokesman for the ESB said that the app is currently being reviewed based on feedback from EV users. One 100 per cent, 55 minute charge later and I was on my way. The Zoe can do anything a ‘normal’ car can do, so 120kph on the motorway is no bother to it. It does drain the battery faster than Eco driving though, which limits the maximum speed to 95km. 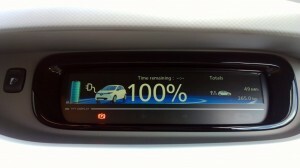 The car has a digital display unit so you can see exactly where your battery’s at and what range is left in it. You can also see how the battery is working – whether it’s draining power to propel the car forward or, if you take your foot off the accelerator while moving, it actually charges the battery. I took charge stops at Mayfield Junction 14 on the M7, Roscrea, Nenagh and Adare for times of between 20 and 55 minutes. I had a quick systems check in Abbeyfeale to sort out a Check Connections error notice – I’d unplugged the charger in the wrong order. All but the Adare and Abbeyfeale stops were in well lit areas. The charge point in both Limerick towns are in isolated car parks off the beaten track. I pulled in to those stops late at night and I would not feel safe there on my own at these times. A spokesman for ESB said that charger locations are selected in conjunction with the relevant local authority or private host ie a filling station. He added that where permitted it ‘has marked the area with ground markings and signage to identify the space for EVs’. One of the car parks we charged at had no special markings, with the result that non EVs had taken all four spots closest to the charge point. It is illegal for non EVs to park in an EV charging spot and standard parking penalties apply. The ESB spokesman said that it is currently in discussions with local authorities to make sure designated EV spots are marked as such. The key to a successful road trip in the Zoe is planning and I did much better on the way back – comfortably arriving on just two full charges. I had a total drive time of five hours – allowing for a 14minute traffic delay through Adare and a separate charging mishap, which cost me 20 minutes. 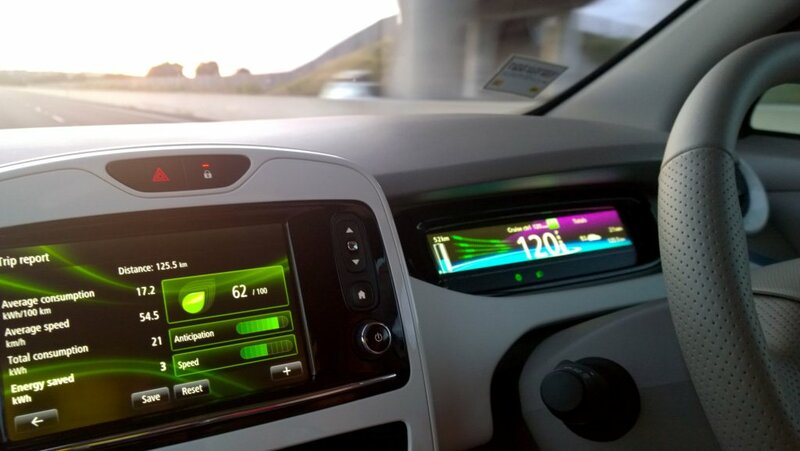 However, keeping the number of charge stops to two meant that I had to spend the first two legs of my return journey in Eco mode – not easy when you’re ‘that guy’ on the motorway and everybody’s overtaking you. If you do need to overtake, you can put your foot down hard on the accelerator and it will momentarily override Eco to allow you to safely do so. The Government has a target that 10 per cent of all new cars on Irish roads by 2020 will be electric vehicles. The ESB said it anticipated a ‘gentle uptake’ of EVs but believes that when driver familarity and range improves, so too will people’s interest in EVs – particularly in multi-car housholds. However, while the Renault Zoe is great in the city, its current range means that it’s just not practical for longer journeys. And the Zoe isn’t alone in this – most EVs available in Ireland have a similar range. US EV company Tesla is hoping to change this. Its Model S has a range of 420km on a single charge. The company has opened its research to traditional car companies so hopefully we’ll be seeing much improved battery ranges across the board in the near future. The Zoe’s low running costs should make it of interest to low mileage urban commuters and families using it as a second car, however the monthly battery fee associated with the Renault, which starts from €50, could well take the gloss off of that. While I found the cross country journey in the Zoe very tedious, overall, as a city driver, I liked the car and I was a little bit sad handing it back. 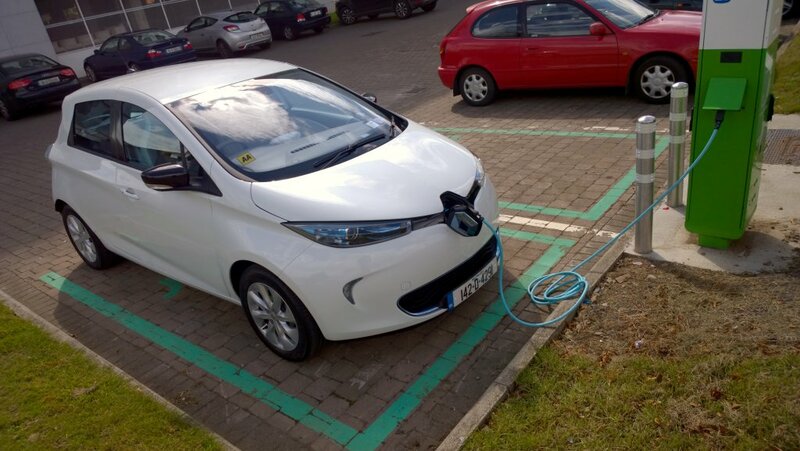 Some 125 electric vehicles were sold in Ireland in the first six months of this year. This compares with just 49 in a full year last year. In total, there are between 700 and 800 EVs in the country. Visit the ESB eCars site or its Facebook page for further details on EVs in Ireland. Did you actually charge to 100%? It's a rookie's mistake but it's a time waster, really tedious when you're at a busy chargepoint, with a queue if you're unlucky. The 80% or 85% - 100% charge runs at a trickle and is far slower than a 0% - 80% charge. You can almost double your waiting time for that last measly 15% or 20%. It could've saved a lot of time on the journey. It would've been a good call to check the tire pressure too, a slight increase in psi can make wonders with efficiency and thus range. @offib Actually the Zoe only slows down after about 95%. You are comparing it to a Leaf. Different car all together and less flexible when it comes to charging. 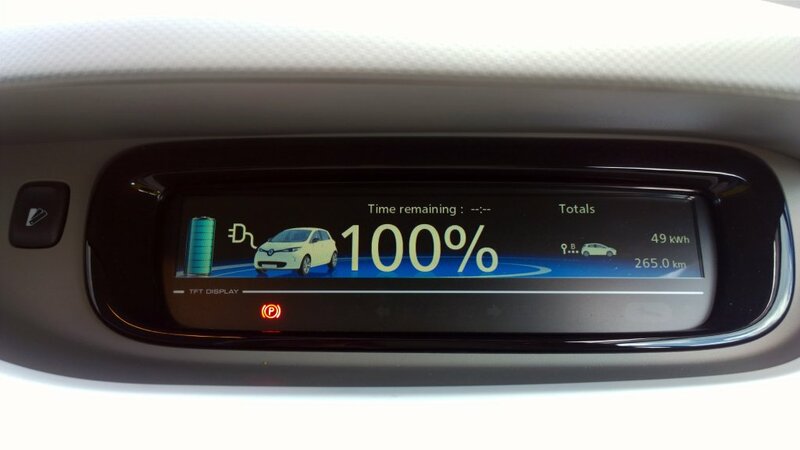 A standard charge point would only charge to Leaf to 100% in about 4 - 8 hours. Zoe will do it in 1 hour to 1:20. Great little city car. Have mine for about 3 months now and am delighted. Have been to Galway, Limerick, Dublin and Cork and have had no issues. Take your time and plan your journeys and Zoe will not let you down!